Place partially thawed strawberries, sugar and banana pieces in blender with ice cream or milk. Blend until thick and slushy. Remove and transfer to a bowl. Wash the blender and add the frozen yogurt, flavoring. Blend until smooth. Place crushed candy cane pieces on a paper plate. Pipe the top edge of three 10-12 ounce glasses with the green decorating gel. 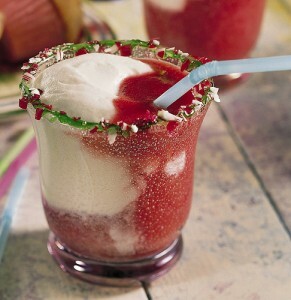 Dip the rim of the glasses into the candy cane mixture. Pour half of the strawberry and yogurt mixture into each glass. You want to create a half and half mixture. Use care and pour both mixtures at the same time. Top mixture with a whole strawberry and insert a straw for sipping.